In addition to our current methods of communication, we have been provided with a new messaging service called Mjog. 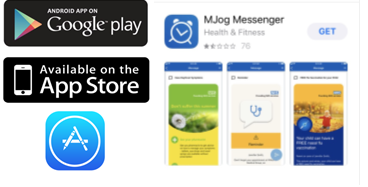 MJog is a free App for patients allowing quick and easy two-way communications with us at the Surgery. Patients will be able to use the App straight out of the box, providing patients with a convenient way to manage appointments, be alerted about services and receive reminders from us. It is free to download with no message costs. It’s a simple process to cancel appointments in ‘one click’, provide feedback to or complete patient surveys and NHS campaigns (such as Flu vaccinations, cervical smears and NHS Healthchecks). Please do not assume this is a spam message! Patients who have previously opted out of receiving text messages, should not receive this message. MJog gives patients the ability to text back saying “CANCEL” or “DECLINE” for example instead of phoning the Surgery to cancel their appointment or decline a flu vaccination. There is one major difference with this new system – Appointment Confirmation messages will no longer be sent immediately. You will receive a Confirmation Message one week prior to your appointment and then a Reminder message the day before your appointment. If you book your appointment less than one week in advance, you will only receive the Reminder message. We have been rated as Outstanding by CQC. The Carers Coffee afternoons will run throughout 2019. These will be an opportunity for you to find out more information about services available within the local area. Please come along and join us for a chat. It's very relaxed and informal so please do join. If you have any queries, please contact Ramsbury Surgery on 01672 520366 and ask to speak to Maggie Gregory, our Care Coordinator. We are delighted to say we have achieved a Platinum Award for supporting Carers within our Community. This award is in recognition of the services and information we provide to our patients who are in an unpaid Carers role. This is an annual award and the first time Platinum level has been awarded. It is a wonderful achievement for the Practice and all the staff. Did you know that you are in control of who has access to your health record? We want to help you understand what this means and help you to make a decision about sharing your health record. Once you have read this leaflet, complete and return the attached form to let your GP know how you want your health record to be shared. We will not share your medical record without your explicit consent. Please feel free to take part in a very short survey on your experience at our Practice. Click on the "Friends and Family Survey" link on the right hand side under "Have your say". We are now trialling sending this link out via text message to random patients after they have seen a GP, Nurse or HCA. Your cooperation would be hugely appreciated!